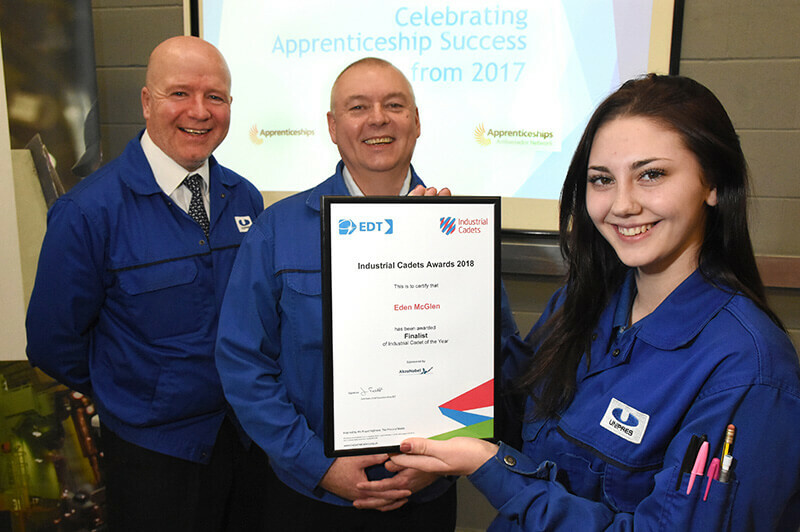 Unipres prides itself on being a company that has been committed to apprenticeships since our inception almost 30 years ago. That is why we put so much time and effort every year into celebrating National Apprenticeship Week. The five-day event offers the perfect opportunity to shine a light on the benefits that young, enthusiastic recruits can bring to a business. For example, during Apprenticeship Week 2018, we organised a host of events to educate schools, students and young people about engineering career opportunities, as well as laying down some challenges to current Unipres apprentices, including an Army-style bootcamp. Kicking off the week on Monday, we hosted a Primary School Engagement Day, which offered a window on the roles and responsibilities of an apprentice working at Unipres. Then, on the Tuesday, we worked with pupils from Sunderland’s Castle View Enterprise Academy in an Industrial Cadets Taster Day – a national industry-led accreditation designed to enhance workplace experiences for young people – before attending Sunderland College’s ‘Apprenticeship Work’ event. Rob Dodds, Apprenticeship Co-ordinator and also a member of the North East Apprentice Ambassador Network, attended an Industrial Cadets Awards event on the Wednesday, to recognise the work achieved through our school engagement programme, and then we hosted an evening Apprentice Open Event to educate young people and parents about the varied and exciting apprenticeships we offer. On Thursday and Friday, we participated in Hartlepool College’s Apprentice Event and competed in the heats of the North East Business Awards – where we were shortlisted for Best Apprenticeship Provider. We also held a breakfast morning celebrating our apprenticeship achievements over the past 12 months, before a platoon of brave young 1st year apprentices scrambled for a weekend residential undertaking challenges in Army Bootcamp style. But the work doesn’t stop at National Apprenticeship Week. We are always on the lookout for new apprentices and work incredibly hard all year round to not only attract the best and brightest, but also to ensure the level of training they receive when they get here is of the highest possible quality. That’s why we launched the Unipres Training Academy, which was opened by Sharon Hodgson, MP for Washington and Sunderland West, at a ceremony attended by business and civic leaders as well as a host of former and current company apprentices. Through the training academy, we work directly with the North East Apprenticeship Ambassador Network (NEAAN), a group of firms spearheading the drive for employers and young people to commit to apprenticeships. Unipres is a global organisation, with a Sunderland base for almost 30 years. Employing 1,400 people, we are now a Tier 1 supplier of car components to Nissan, Renault and Honda. However, this would never have been achievable without our apprentices who, over the years, have formed the foundations of this fantastic business. So, with the number of apprentices we recruit growing year-on-year, we already can’t wait to see what Apprenticeship Week 2019 brings!